All your Silencer and Pipe work requirements will be designed specifically to fit internally or externally to your power unit. 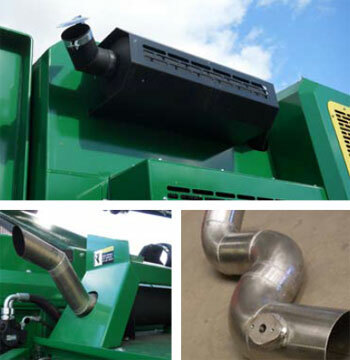 All Tier 3 Engine exhaust systems can be catered for. Vacuum units are also available either incorporated into the silencer or as a separate unit attaching to your pipe work. Exhausts supplied for Tier 4 engines. SCL have already completed extensive R&D on the new Tier 4 Final Engines. Stainless exhaust systems have been tried and tested to meet with the engine manufacturer's requirements.